When it comes to substance abuse, whether it is drugs or alcohol, we want to ensure that we reiterate the dangers of these substances and the consequences of using them. Sometimes, as parents, we may accidentally expose our children to prescription drugs or alcohol unintentionally which can have a long-term effect on their views of these substances. The issue of substance exposure can often be overlooked but it is one that needs to be taken more seriously if we want to raise future generations that understand the dangers of substance abuse. By ensuring that our children are not exposed to substances of abuse at a young and impressionable stage, we are taking the right precautions in their mentality of substances. If you are an individual who has been prescribed prescription medication, it’s important that you take these drugs in private and hide them out of eye-sight when you are finished. This could mean placing them in a medicine cabinet or in a place that is out of reach and sight of a child. With an increase in the number of opioid prescriptions comes the increase in the number of children getting a hold of these intense medications. It is extremely hazardous to the health of a young child if they happen to take these pills thinking that they are candy. Every year, thousands of children are rushed to the emergency because they swallowed prescription medication that has adverse effects on young children. By educating yourself on the harms of having these drugs exposed to kids, the dangers of them getting their hands of them are lessened. Studies have shown that children who are under the age of five are the most vulnerable to drug exposure. If children get a hold of medications, they can be lethal. It’s important that prescription medication containers have childproof packaging as well as vital consumer education information so that adults understand the ramifications of their children coming into contact with the medication. Another consequence of exposing children to medications, as well as alcohol, at a young and malleable age is that they may grow up thinking that it is normal to take pills and to drink alcohol. When children see their parents doing something, they are very likely to imitate their actions. Studies have proven that children who are raised in families that abuse substances are much more likely to abuse substances as well as opposed to those who were never exposed to substances. 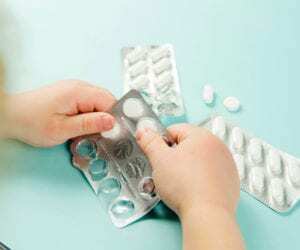 Even if you are not abusing substances and simply taking medication due to health reasons, it’s important that you lessen your child’s exposure to prescriptions drugs.